Over the past 12 years, Sam Mylin has created a series of paintings focused on the Twelve Days of Christmas as worship to God. The final piece will be unveiled on Christmas Eve at Grace Church at Willow Valley, Lancaster, Pa. (John F. Smith, pastor). “I felt like the little drummer boy with ‘no gifts to bring.’” Sam Mylin remembered attending the 1999 Christmas Eve observance at Grace Church at Willow Valley in Lancaster, Pa. (John F. Smith, pastor), with his wife, Kate. 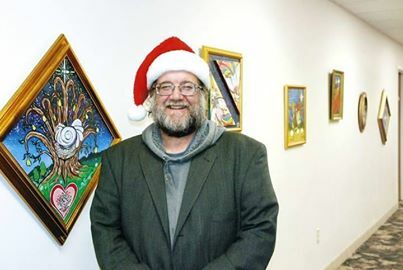 An artist who leads children’s workshops at the Lancaster County Art Association, at the Delaware Art Museum in Wilmington, Del., and in local churches in eastern Pennsylvania, Mylin felt led to present his own unique gift. He’d create a painting. Moved by the story of the Christmas song, “The Twelve Days of Christmas,” he thought he might interpret the images in one painting. “It was used as a catechism for the church to teach children the basics of the Christian faith,” he noted. As he began to pray and talk with others about the project, he felt like God was telling him to paint one [verse] at a time. The first, “A Partridge in a Pear Tree,” was completed for December 24, 2002. As he revealed it to the few in attendance that evening, a small voice whispered in his ear: “Give it away to a loved one.” Bob Kern, a Grace Brethren pastor who served on staff at the church for ten years until his death in 2011, and his wife, Dorothy, received the painting. It began a 12-year tradition of exhibiting the paintings in the days before Christmas, then unveiling the new work of art in the foyer of the church following the service. “The clock began ticking each year as I completed another painting,” Mylin said. As paintings were distributed to “loved ones,” they were presented on the condition it be returned for the Christmas Eve unveiling. This year, the exhibit has been on display through Advent. Mylin sees significance in how the tradition has taken root. The paintings range in size from 11- by 14-inches to 16- by 16-inches and each has both a secular and biblical meaning. Framed in gold to represent the “edge” of a Bible, only Five Golden Rings is presented in an oval frame. Three paintings are conceived as diamonds, for these are vital and valuable to the series, according to Mylin. The rest are presented in a square format. Each painting has contains a star, a heart, a cross, and a bird, and each is painted on a blue background. He’s called the finale, “Love Happens, Love Counts!,” for it is the last time this series will be together. “All of my notes, studies, and sketches will then be given to the church to use as they wish,” he said. Each painting has been digitally photographed and he hopes the church will use the images to spread the Gospel. Click here to read more about the “Twelve Days of Christmas” paintings.